Designed by Patrick Murphy, these captivating earrings feature Black Quartz Druse 4.23 tw (12.5 mm x 8 mm) and Diamonds 0.06 tw. 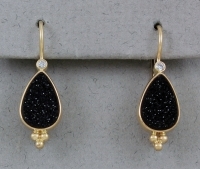 Presented in 14k Yellow Gold, each earring measures approximately 1 1/8" x 3/8". They are truly spectacular! These beautiful earrings are in stock and available to ship immediately. Patrick Murphy has been making jewelry for over 30 years. Constantly in search of unique material, many of the gemstones he finds are often so rare that people have never seen nor heard of them. Nearly all of Patrick’s work is hand fabricated including lapidary, since it is difficult to find cutters who are able to produce the shapes and sizes that he requires. Most gems are set in bezels because it makes a clean frame around the stone. Also, bezels are much more secure than other types of settings.